Prolong the life of your decks with our SK8KINGS nose and tail guards. 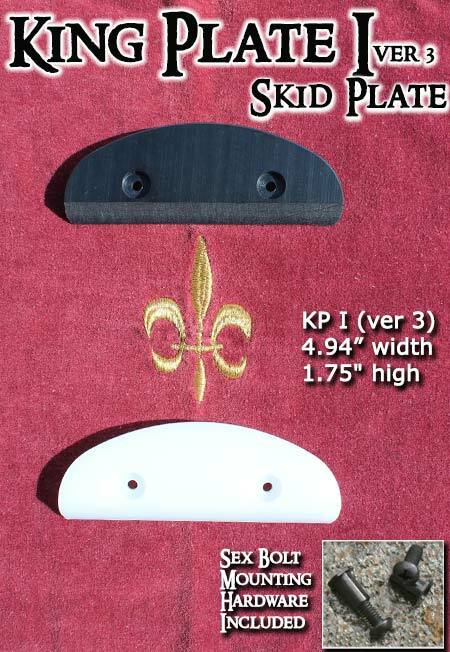 The redesigned King Plate I is the latest version of our King Plate I. Designed to fit the nose of the Primo Slide, G-King & Jester decks but also works great with most standard street decks AND the Loaded Bhangra & Earthwing MiniGlider decks too. Double drilled with countersink bolt holes -- gives extra life before you grind down to the bolt head. Super strong steel t-nut mounting hardware included. Hardy yet light with a beveled edge for good control. Mounting Notes: The black cylinder nuts go from top to bottom through the deck (so the low profile head is nearly flush with the deck top) and the screws goes in through the bottom -- tightening into the black cylinder -- similar to the way a typical lock nut would work. This hardware is extra strong like that so perfect for mounting the plates. Lay the plate on the deck surface you will mount to - mark the deck surface through the center of drill holes - and then drill for the size of the black piece (drill bit size is 7/32). Tip - Use a pointed screwdriver or similar to make a slight indention on each drill hole to have a start point for your drill bit to grab. With deck secure - drill straight through.�When it's mounted - the top will be basically flush and the screw heads will be recessed in the drill hole countersink underside of the plate.